Was excited to get this. Lost 70lbs last year and starting over with better variety of fun clothes. Made by artists skilled in the ancient art of tie-dye, this casually elegant tunic is a vision in rich colors. The collar may be worn down and open, with large lapels, or raised and buttoned to frame your face. 100% heavyweight textured cotton top has a full circle hem, 8 coconut buttons, and 3/4-length sleeves. Sizes S/M(6-12), L/XL(14-18), XXL(20-24). Hangs 38". Hand wash. Made in Thailand. 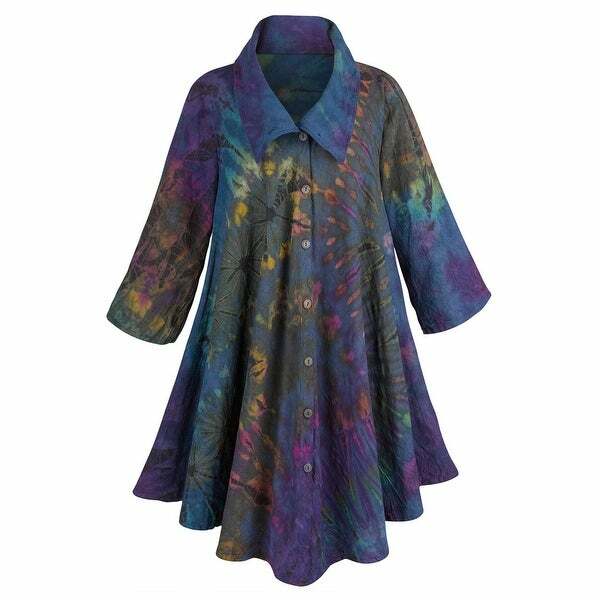 • WEAR A WORK OF ART - Made by artists skilled in the ancient art of tie-dye, this casually elegant tunic jacket is a vision in rich colors. • PERFECT LAYERING PIECE - A fashionable way to keep warm, the fabric is a heavyweight 100% cotton. • DETAILS MAKE THE DIFFERENCE: You'll love the collar that can be worn up or down, wide lapels, and coconut buttons. • CUT TO FLATTER ANY FIGURE - A full circle hem with a slight A-line flare is sure have you looking your best. • HAND TIE-DYED - Created by artists, each one is unique as slight variations in color and pattern exist. Beautiful, artistic and unique piece of clothing! Classic and flattering cut! I receive lots of compliments on it each time I wear it! So much fun! Love the colors and such a different look to go with a short skirt or jeans I'm happy with the purchase.I like to purchase pieces that are different and this will go with so many outfits. I love this jacket. The only thing it's lacking his pockets. I plan on putting pockets into it.The colors are beautiful and the fabric is a nice weight.. I ordered two of these. Both are much pricier than the quality of the garments justifies. At least this jacket didn’t arrive with a hole in it. Fabric is sewn with basting length stitches. Jacket is not soft to the touch. Would expect much higher quality given the price tag. I love it and get many compliments when I wear it. Wish there were more, I'd like to get one for my daughter. Very flattering style - looks great with leggings. Easy care. "IS this coat lined? If so, what is the lining fabric?"